Trampolines are a great way to enjoy more outdoor activities at your home, get the kids outside and enhance your Summer! Of course, the classic trampoline will serve you hours and hours of bouncing delight but after a while, you may be interested in raising the bar and seeing how you can improve the range of your trampoline. The following trampoline accessories are popular, family-friendly summer accessories we recommend for doing just that! When you and your children are outside this summer, you want to be sure that everyone is properly protected. That’s because conventional trampolines don’t come with covers, so you’ll have to buy them separately. A high quality roof shade cover by renowned trampoline brand Spark, is made to protect your family from the sun so that no one gets burnt or dehydrated. You can enjoy your trampoline for as long as you want without putting your health at risk. It is also a fun way to change the appearance of your trampoline and encourage different kinds of games of creative activities for the kids. It should be noted, however, that Spark roof covers are made specifically for Spark trampolines. 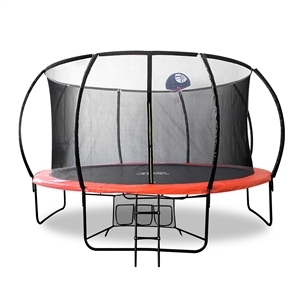 You can combine two kids’ favourites; a trampoline and climbing features to double up the fun and get a more unique set to enjoy at home. With a trampoline climbing bar, you can turn your trampoline into a mini playground. It’s also an added opportunity to get your children to spend their pent-up energy. These climbing bars are free-standing and they’re easy for you to install so you don’t have to wait around for anyone else to do it. TR Sports climbing bars are coloured with powder coating, so your family won’t be exposed to dangerous chemicals or toxins when they’re climbing around. In comparison, paint often contains volatile organic compounds (VOCs), which can be dangerous for human beings and the environment over time. When jumping around becomes too exhausting, your family can enjoy this trampoline hanging set. The set allows for you or your children to sit and swing before they get back onto the trampoline to play. This set is strongly made so don’t have to worry about your children falling off. With this hanging set, your children will be sitting on a net so they won’t be scratched or injured when they’re swinging. Safety first! These accessories are more about security and less about fun and games. When you build a trampoline, it’s essential for everyone to be safe. Since people will be jumping up and down on the trampoline, the wrong anchors can put everyone in danger. If you’re using a Spark trampoline, using a Spark Trampoline Anchor Kits is your best bet for the using all right accessories to ensure that your trampoline stays exactly where it’s supposed to be. When you don’t use reliable anchors, you risk the chance of having your trampoline blown away with the wind or having the entire thing collapse with your family in it. If you own a trampoline and you want to help it live to its full potential, you’ve come to the right place. That’s because, at TR Sports, we have some of the best accessories to ensure that your trampoline is both safe and fun. All of the above items can prove to be great tools for your trampoline. If you have any more questions about our trampoline sets or any accessories you might be interested in, feel free to contact our team today! We’d love to answer any of your inquiries.